Machined this yesterday evening for the drag car. Had to grind a custom tool for the belt profile. The motivation for this is not more power but to slow the alternator down. Since we experienced belt issues with the stock alternator over 7500rpm accompanied by electrical glitches sometimes resulting in nira shutting off! This persisted even after swapping to a 90amp and deleting P/S. It was an Alt overspeed problem too. Since the new rev limit is closer to 9k I just changed the pulley in that percentage. Most likely would not work on the street with AC etc. Im hoping the belt stays happy for now. Probably a little on the sturdy side. Rather it be a couple grams heavy and not ever be an issue. We also have been very busy in the CNC shop. These custom drag wheel center caps steve did last week came out really neat. 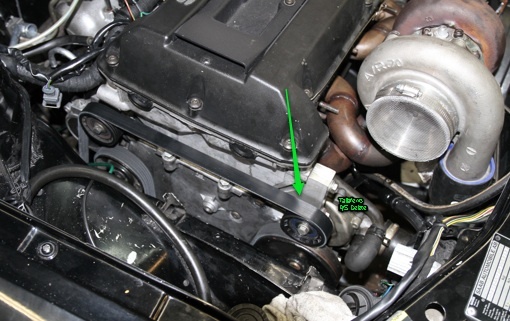 This entry was posted on Saturday, April 23rd, 2011 at 10.25 am and is filed under CNC / R&D Parts, Drag 2.0L NG900. You can follow any responses to this entry through the RSS 2.0 feed. You can leave a response, or trackback from your own site. thumbs up for the upgrade…as you said over and over again, each part should do it`s job, so I get the “not more power but to slow the alternator down”. Yet, as I have seen on various other brands, a lighter puller might result is some power gain…would you consider developing such a part? Might be able to make a little power gain. Swapping your car from 140 to 90a is also the same. But then you risk not having enough power for AC and top etc. There would be little to no gains. Well under the statistical deviation between runs. Inertia at the alt pulley = far less than run variation. But then again there is a buy and a seller for just about anything. Nick: Just wondering what you did to delete the power steering on your drag car. How is it driving on the street like that? I like the sound of the new turbo. I emailed you on this as well.